Book a festive mini cruise to Christmas Markets in Bruges, Cologne, or Amsterdam. Each year DFDS hosts a selection of Christmas Markets themed mini cruises and this year is no different. They have got three different cruises available. There is nothing more authentic than a truly traditional Christmas market in Germany, so a visit to the Cologne Christmas Markets is a must for a classic memorable Christmas break away. Your break away begins in Newcastle where a ferry awaits your arrival, departing late afternoon bound for Amsterdam. During the crossing you'll have plenty of time to enjoy a meal if you wish, enjoy the live entertainment on-board and to have a drink or two in the bars on-board. As the sailing is an overnight crossing you have the choice of cabins to stay in depending upon your budget. The following morning you will dock in Ijmuiden where a comfortable coach will be waiting, ready to transfer you to Cologne. The journey takes approximately three and a quarter hours as you drive from Holland through to Germany, passing a variety of towns and cities along the way. You will be taken to your hotel for the stay in Cologne where you can check-in and unload. It is then up to you what you do for the duration of your stay. Cologne is a vibrant city and has plenty of significant architecture to admire including the imposing twin-spired Cologne Cathedral which is where the main Christmas market can be found. A short distance away is the shopping district of Cologne where you can find aplenty of designer names. A short distance away from the Cathedral is the River Rhine which is worth a visit. Besides the Christmas markets there is plenty to do in Cologne as there are loads of galleries, museums, attractions and more. It is a great place to do some essential Christmas shopping! TRIED AND TESTED! I travelled to Cologne on a DFDS mini cruise. You can read my Cologne Christmas Markets mini cruise review here. When it is sadly time to return home then a coach will collect you from your hotel, taking you back to Amsterdam. An overnight ferry back to Newcastle waits, where you can enjoy the live on-board entertainment and can do a bit of last minute shopping on-board. Cologne Christmas Markets Mini Cruises sail during December from Newcastle but can be pre-booked early on. Prices start from £259 per person based on two sharing or from £226 per person based on four sharing. 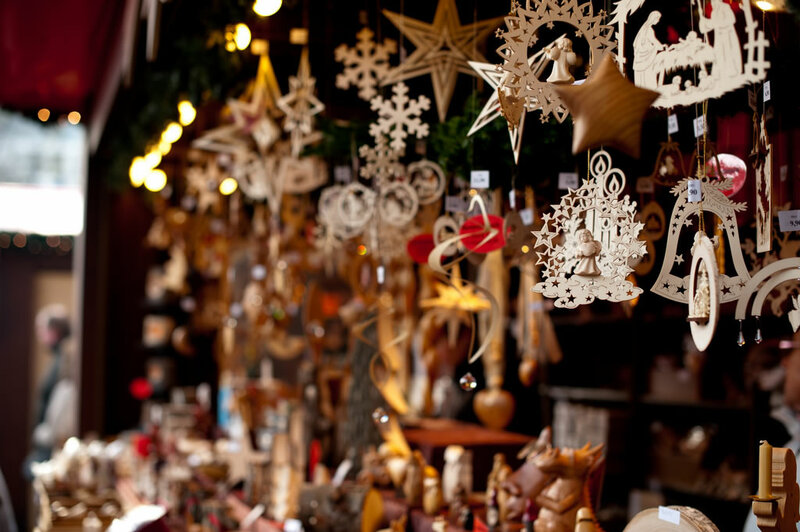 Enjoy an authentic Christmas market in the quaint UNESCO-listed Belgian city of Bruges. There couldn't be a more perfect setting for the Christmas Markets. An ice rink is set up on Bruges market square surrounded by traditional market stalls boasting a range of food drink and crafts iconic to Belgium. Bruges itself offers plenty of monuments and cultural attractions as well as plenty of medieval architecture. You can explore Bruges on foot or by canal, exploring the many streets littered with lace and chocolate shops. Bruges is the self-proclaimed 'World Capital of Chocolate' so if you are after true Belgian chocolate then you have come the right place! Your Christmas markets mini cruise begins in Newcastle where you set sail on-board a modern ferry bound for Amsterdam. On-board you can enjoy some delicious foods, or relax in a bar enjoying the live entertainment. Choose from a selection of cabins to suit all budgets from budget inside cabins to sea view Commodore De Luxe cabins. You will dock in Ijmuiden the following morning and will be taken by a comfortable coach to Bruges which takes around three and a half hours. You will be dropped off at your hotel for the break and once you've checked in you can explore Bruges and the Christmas markets at leisure. At the end of your stay the coach will transfer you back to Amsterdam for an overnight sailing back to Newcastle. Bruges Christmas Markets Mini Cruises sail during December from Newcastle but can be pre-booked early on. Prices start from £229 per person based on two sharing or from £198 per person based on four sharing. This three night break to Amsterdam is perfect for getting in some Christmas shopping, and the break can be extended with additional nights spent in a hotel in Amsterdam. Your mini cruise break begins in Newcastle where you set sail in the late afternoon. When you book your mini cruise online you'll have the chance to pre-book evening meals on both the outgoing and return sailing which is highly recommended. You can also pre-book a hot buffet breakfast on both crossings for the following morning. Choose from a range of cabins to suit your party group and budget. If you are travelling with children and are having a family break then there are cabins perfect for you. If you are travelling as a couple then you can choose from a budget inside cabin or a more opulent Commodore De Luxe suite. You dock near Amsterdam the following morning where a coach will take you to Amsterdam centre. From here you can check into the hotel you booked as part of your mini cruise. It is then up to you how you spend your time in Amsterdam. Cram in a bit of sightseeing in amongst some essential retail therapy. Amsterdam is a great place to pick up some unique Christmas presents and your visit may coincide with a festive parade and ceremony held throughout the Christmas period in the city. On the day of departure a coach will take you from Amsterdam city centre back to the port in Ijmuiden where you will catch the overnight sailing back to Newcastle. You'll have plenty of time to relax and enjoy the live on-board entertainment. You will arrive back in Newcastle the following morning. Amsterdam Christmas Markets Mini Cruises sail during November and December each year from Newcastle but can be pre-booked early on. Prices start from £115 per person based on two sharing or from £82 per person based on four sharing. These sailings are always popular so it's worth booking as early as you can. In previous years DFDS offered trips to see the traditional German Christmas market set in the medieval fairy-tale town of Hamelin. Sadly this is no longer available. Hamelin was a wonderful picturesque setting to host a Christmas market, with a chance to sample the local foods and drinks - an essential part of any Christmas market! The mini cruise departed from Newcastle late in the afternoon sailing overnight to Amsterdam. Here a coach transferred passengers to the quaint German fairy tale town. Guests could then explore Hamelin at their own leisure discovering the architecture, shopping and cuisine. At the end of the stay a 4 hour coach transfer back to Amsterdam was included to meet the return overnight ferry back to Newcastle. I hope these tours come back again in the future but for the time being the company is focussing on the alternative destinations above. With the terrorist activity in Brussels earlier this year, it is unsurprising that DFDS will not be running a Christmas markets tour to Brussels this year. Hopefully this will return next year. Brussels is a wonderful place to visit and the Christmas markets are truly something memorable. Held annually on Place Sainte Catherine, the Christmas market is huge, with an ice rink and Ferris wheel. Head on over to Grande Place to see the extraordinary medieval architecture and to sample some authentic Belgian chocolate! It's a great place to visit for your Christmas shopping. Your holiday starts in Newcastle where you board your ferry. How you spend the evening is up to you but there's a choice of dining options, entertainment and lounges to choose from. There's also a choice of accommodation available depending upon your budget. You'll arrive in the port of Ijmuiden the next morning where a coach will transfer you to Brussels. It's around a 2.5 hour journey but it doubles up as a sightseeing tour as you'll pass through loads of varying areas along the way. You'll be taken to your hotel in Brussels which is home for two nights. It's then up to you what you do and how you spend your time. Take a look at the architecture, browse the shops, sample the local cuisine and meander around the myriad of chalets in the Christmas markets. TRIED AND TESTED! I travelled to Brussels on a DFDS mini cruise. You can read my Brussels Christmas Markets mini cruise review here. On the day of your return sailing you will be met at the hotel by your coach driver where you will be chauffeured back to Ijmuiden for the evening sailing. Relax on-board as the ferry sails across the North Sea back to Newcastle where you dock the following morning. Brussels Christmas Markets Mini Cruises sail during December from Newcastle but can be pre-booked early on.